I AM STILL WORKING UNDERCOVER FOR THE BIG "N"
In the past in Toronto if I wanted to attend a parade I would go to the assembly area and there I was able to take close ups of those participating and whatever floats or other items for the parade. I did this with parades like the Santa Claus Parade, the Gay Parade, Carabana to name but a few. I was determined to go to the assembly are of the Bastille Day parade. This required me getting up at 7 a.m. in the morning and getting over to the Arc de Tromphe for it was there that the parade marched down the Champs Elysees to the Place Concorde. I took a cab to within a half-mile and walked the rest of the way on foot. However the best laid plans of mice and men sometimes don’t work out. The staging area was at the Arc de Tromphe and many streets radiated from there. On each of these streets units were assembled. However moving between the various streets was restricted so I got only two or three streets. I took as many pictures as I could and sat down and had a coffee. The tempo and crowds began to increase and by about 9 a.m. the street was filled with people headed for the Champs Elysees. Along the route the evening before the authorities had organized pens to sectionalize people away from the curb and as a crowd control precaution. They took barrier gates and made a square at the curb and repeated up and down the Champs Elysees. This kept people at a distance from the curb and actually allowed better viewing. Behind them they made a square with barrier gates that would hold about 100 people. The police were very dictatorial about any movement once you had been corralled. Confession. I don’t do crowds. What to do? The hell with a view behind somebody, I had a sense of the occasion I retreated to my hotel to watch the parade. This is a military parade. The only other one that has the same effort is across Red Square on May Day. The parade starts and ends with the Paris Fire Department. 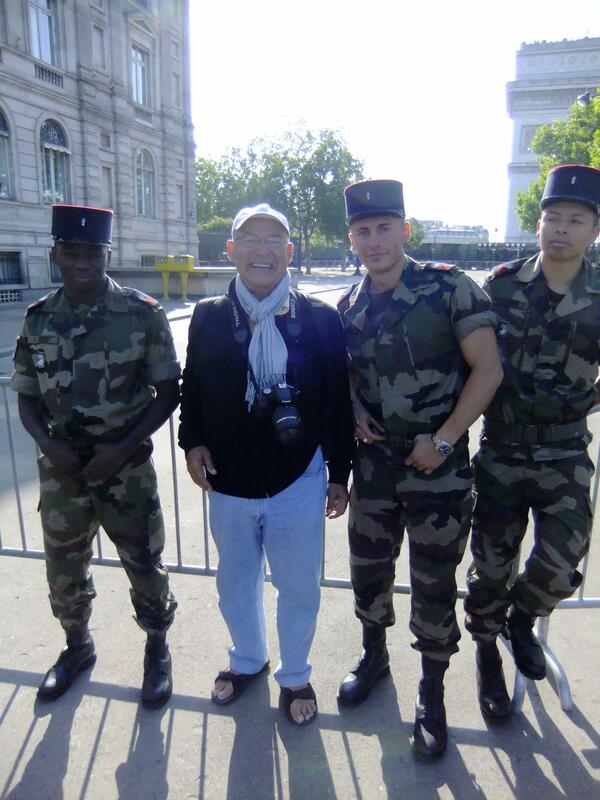 They and the police in France are under the military. Each of the various elements of the arm forces has several units marching in the parade. The army would have artillery, marines, tanks, foot soldiers and the like. All units wore their Sunday best dress uniforms. These are usually uniforms that were worn in the 18th and 19th century. A lot of swords, two cornered hats, epaulets on the shoulder kind of idea. Each marching unit was 12 men across and 12 deep. No one smiles in the parade. The military is serious business. They march in lock step down the Champs Elysees. The view from Place Concorde where the reviewing stand and the President are up the Champs Elysees is spectacular. The Champs Elysees slopes down from the Arc de Tromphe to Place Concorde. A giant flag hangs under the arch of the Arc de Tromphe and the street was painted in parallel colours of red white and blue. At certain areas more elaborate paintings are on the street surface as well. The view with a dozen units marching in lock step down the avenue is spectacular. In addition to the armed forces every military school in France has a unit that marches in the parade. Young Turks lead by some older man decorated with medals. Vehicles and tanks also fill in the parade. The most spectacular part is the Calvary consisting of some 124 horses and men. They are all plumed up and breast plated with tussles on their ornate helmets. You could see how in the past this herd of Calvary would strike fear into the hearts of men. Unlike a parade in Toronto where the street cleaners follow the horses to clear up the following units tough it out and march stoically through. I am told in England during the Queen’s Birthday celebration the horses of the Horse Guard don’t do a dump on the parade ground. They seemed to be trained or not fed before the assembly. A band played martial music by the reviewing stand but at many points they would stop playing and the soldiers in the passing unit would sing their units fighting song. The most impressive unit was the Foreign Legion. All these men had full beards, a leather apron and an axe over their shoulder. The legionnaires hat and heavy boots with puttees wrapped around their ankles. They don’t march like the other units they do a slow strut and arrogant slow strut. Most men’s chest have a billboard of medals. These guys look like they can fight and have been fighting. They of course sang their warring song. I would like to hear what a translation of their song was. Here is a question for you. What are the following words to this song from? Perhaps if I sang it in French you would recognize it. It begins with “Allons enfants de la Patrie…If you haven’t guessed by now I would be surprised, it is the La Marseillaise. This was originally the marching song of volunteers from Marseille during the French Revolution. A song much like the unit songs being sung during the parade. Oh Canada our home and native land sounds less blood curtling then the La Marseillaise. Sarkozy took the salute standing from the reviewing stand with a straight face for the entire parade. As each unit passed they lowered their flags and swords in salute to the President and then split in two one group going left and other left. Any vehicles in the parade had the occupants save the driver place their hands so they were visible. I imagine this is a precaution against assassination of the President. Everything was in perfect order. The sky then thundered with a jet formation-passing overhead leaving a vapour trail of red, white and blue. Shortly thereafter fleets of helicopters flew by in salute. I am surprise they didn’t have warships on the Seine to add to the affair. All of this I watched on the television in my hotel room. I took pictures of the screen so you get the idea of the parade. That evening launched from the Tracadero opposite the Eiffel Tower was a giant fireworks display. People lined the Seine and its bridges, on the Champs de Mars, in Parks, from rooftops anywhere they could gain a view. Here’s a thought. The most powerful military country in the world doesn’t parade its armed forces in fact it has a parade of flowers or huge balloons. The only time I recall troops marching in NYC was at the end of WWII. At the end of this military parade if asked for my impression it would be what Sutherland said in the movie The Dirty Dozen. He was asked to impersonate a general and inspect some troops. He did so and then turned to the commanding General and said, “they’re pretty but can they fight”? That afternoon Elizabeth and I took in the Museum dOrsay my favourite of all the Paris Museums. In the 70’s they converted a grand old train station into a museum. The likes of Gauguin, Van Gough, Degas and others hang there. Elizabeth was very impressed and joined in my appreciation of this fine museum.